Patan is the ancient capital of Nepal, located a 40-or-so-minute taxi ride outside of the Thamel (tourist) area of Kathmandu. My trekking buddy, Ellen, and I had heard about it from a fellow trekker while we tackled the Annapurna circuit. 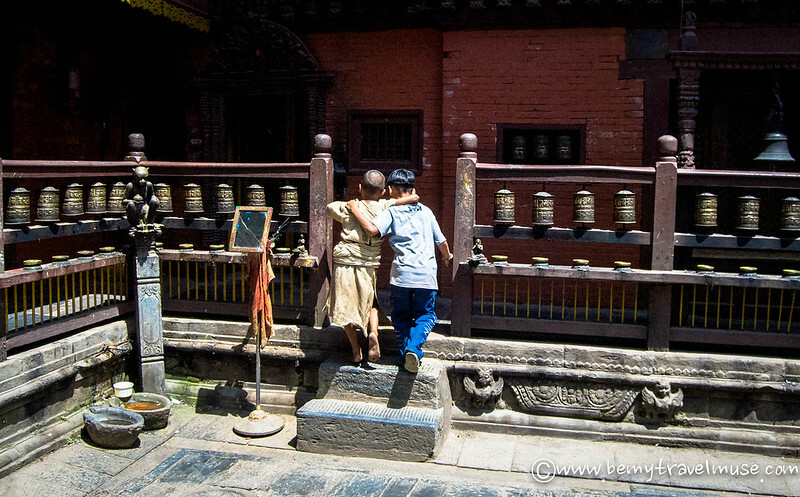 When our plans had us in Kathmandu at the same time, we met up and elected to check out this ancient city. 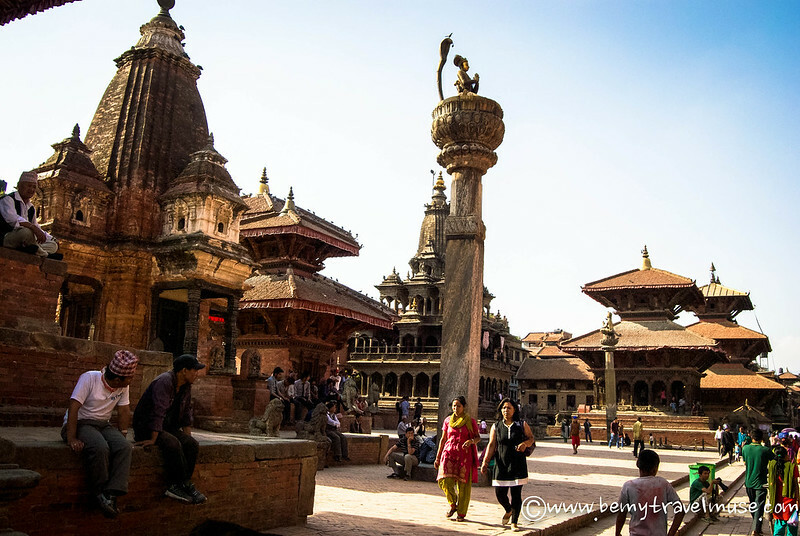 At first glance, Patan looks like a larger version of Durbar Square in Kathmandu, complete with the bogus entry fees for foreigners. Little did we know that we had arrived on a major holiday and were about to experience something truly out of the ordinary. While Ellen checked out the museum I wandered around the ruins. 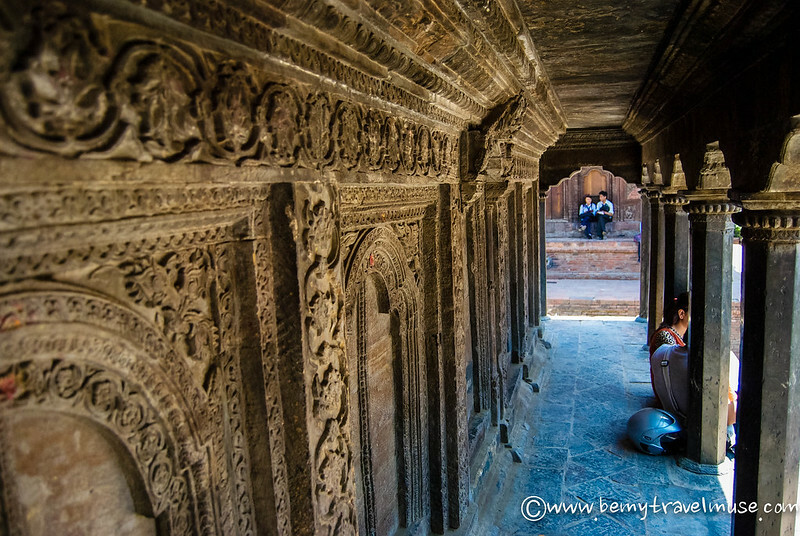 What I love about the Durbar Squares I’ve seen in Nepal, and especially Patan, is they’re not blocked off from human touch. All day long visitors — mostly locals — sit along the ridges and steps of the various temples enjoying the day, hanging out with their friends, or selling spices, flowers, and bracelets. I glanced at the time and realized I needed to eat something. The thing about hot weather is, sometimes I just forget to eat! There were plenty of cafes around pandering to tourists but that’s not what I wanted, so with a little more wandering, I found a little boy dishing up something called choila, which means “mix”. It involves pounded flat rice, which is crunchy, and in this case, some bamboo, chickpeas, and potatoes in gravy. Sitting between an old, smiling, local man and two girls who asked the boy to give me more gravy, I felt happy to have found the perfect spot. 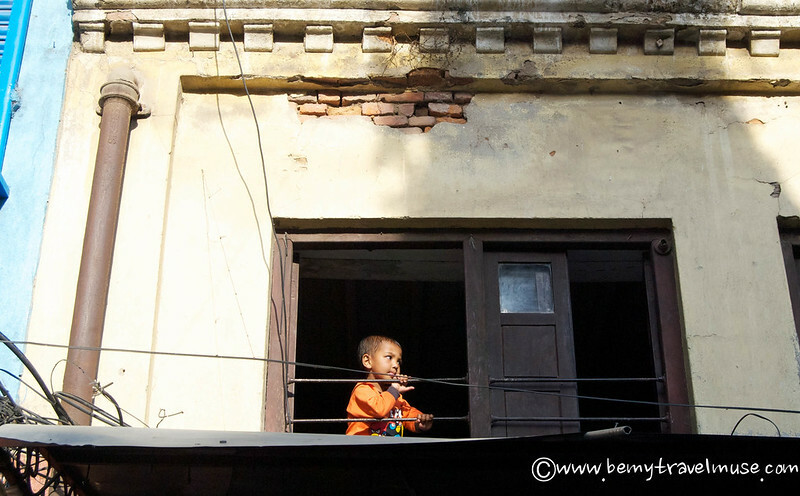 When I walked back to meet Ellen, playing ball with some kids in the square along the way, I ended up talking to the one of guys at the ticketing counter who asked me what I thought of the local Nepali food. He had noticed me eating there, happy to see that I was trying to immerse myself a bit more in the local culture. As an added bonus, he explained there would be a tree-like float and at some point a coconut would be thrown from the top of it. Apparently this was a big festival during which a giant float had been paraded around the town all day, and it would all culminate in an hour or so just down the road from where we were at that moment. It didn’t make much sense to me but nevertheless, sounded too good to miss. 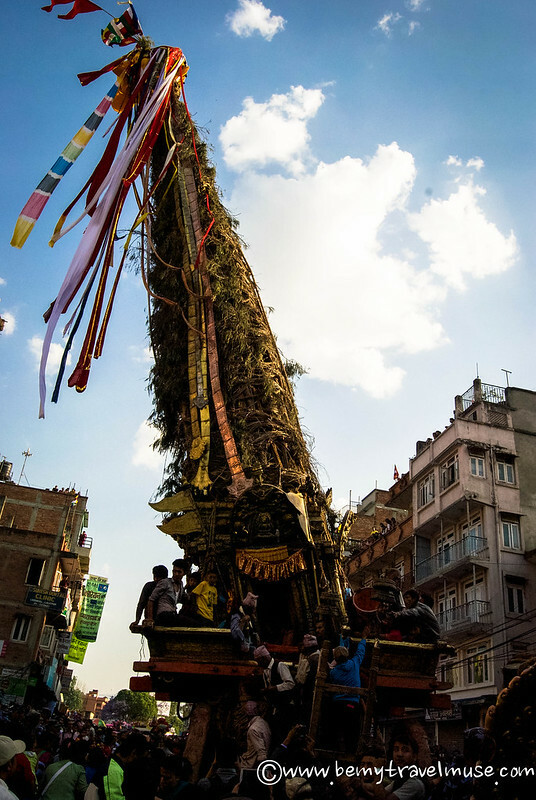 The festival is called Rato Machhendranath after the god of rain (an incarnation of Shiva) whose temple in Durbar Square of Patan has been there since the 1600s. Given this takes place right before monsoon season, it’s an opportunity to ask for rains for prosperous crop yielding. 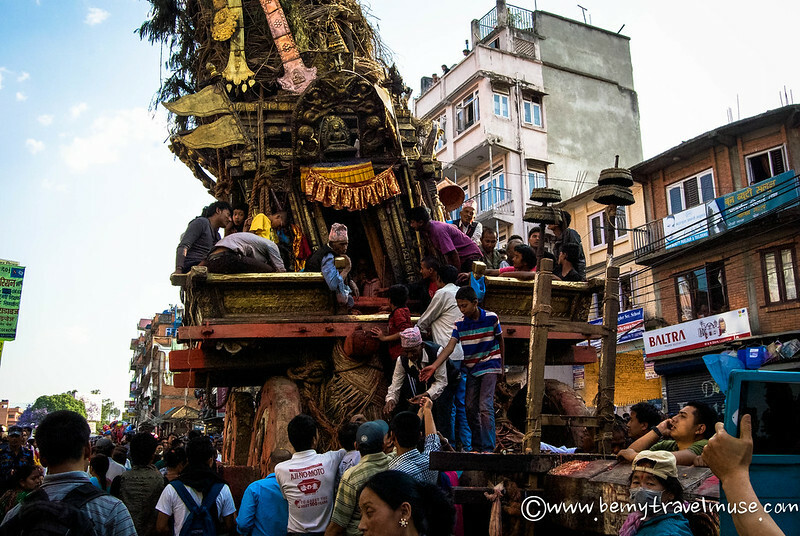 It’s celebrated by parading a chariot, or Bunga Dyah Jatra, through the streets. It culminates when a priest climbs the float and throws a coconut down into the crowd. Whoever catches the coconut is considered to be very lucky and has a great year ahead to look forward to. For this reason, the coconut isn’t claimed easily and usually a brawl ensues between the masses, each person eager to be the winner of good fortune. 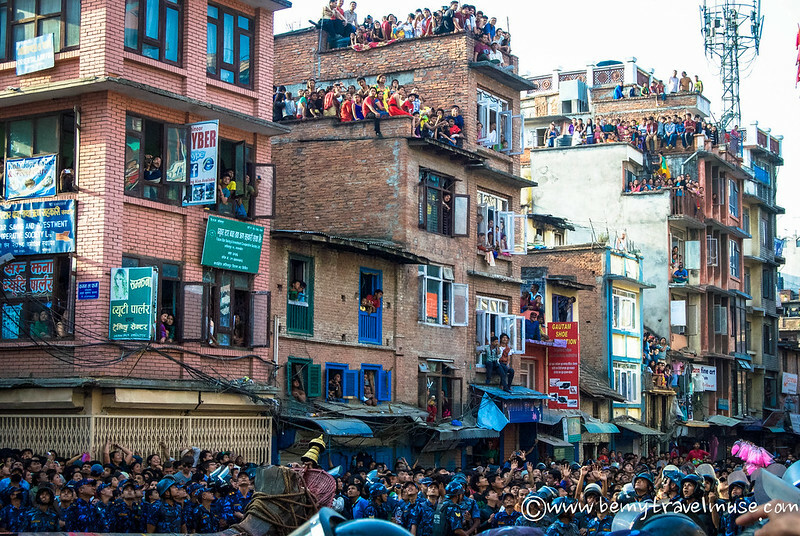 Little did we know this is one of the oldest and most important festivals in Nepal. Walking about ten minutes down the street he pointed out, vendors all along the peripheries, tons of people walking through, seabuckhorn berries for sale wrapped in newspaper, the float finally made itself visible. It looks like a Christmas tree from Who-ville! There were riot police all along the sides, some smiling big when they saw Ellen and I, the only foreigners in a crowd of thousands. Others filming and taking pictures, just as much tourists as we were. Riot police? Oh goodness what are we in for? 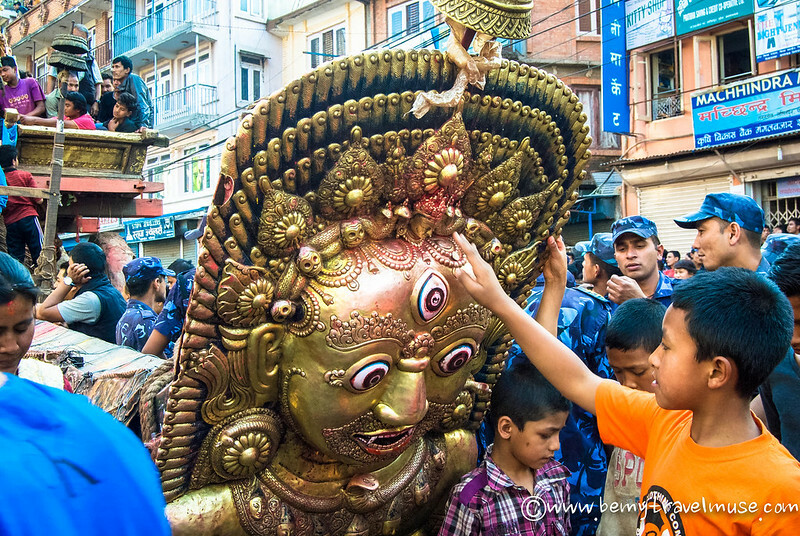 A woman near the front of the float said, “namaste” (Nepali for “hello”), while throwing water at us as a blessing. A man threw a flower to me from the top of the float (which Ellen later said, “I’m not sure if it’s the same as in India, but if it is, he just proposed to you), and another applied a red powder bindi to my forehead. 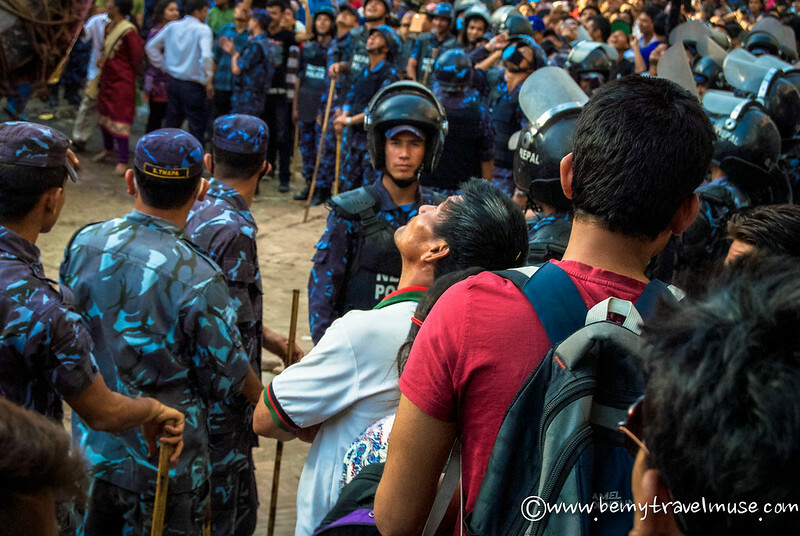 “You’d better move, when the coconut comes, there will be fighting,” one of the riot police said to Ellen as he began putting on his riot gear and readying his bamboo stick. Suddenly it made sense why there were so many people on the tops of buildings or watching from windows. 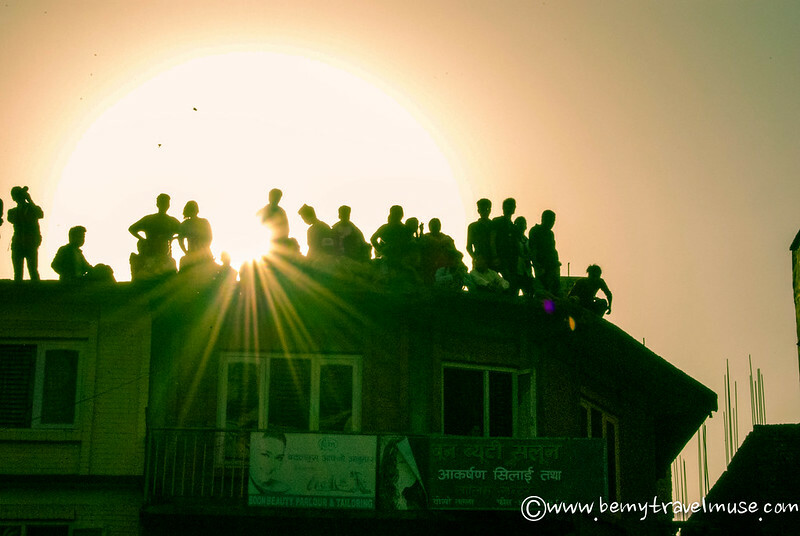 Crowding the rooftops as the sun sets. It’s coconut time! The crowd went wild as a priest climbed the leaning tower of the chariot, coconut in hand. He kept indicating he might throw it on various sides of the chariot, faking everyone out and eliciting cheers each time he pretended to throw it in any given direction. Since Ellen and I were still very much in the crowd without many options of escape, I silently hoped he wouldn’t throw it in our direction. It was meant to be good luck and all, but I was content not to get a bloody nose over it. Finally he threw it in the opposite direction to ours, where a crowd of men wrestled over the coconut until one emerged victorious. The crowd erupted in cheers. 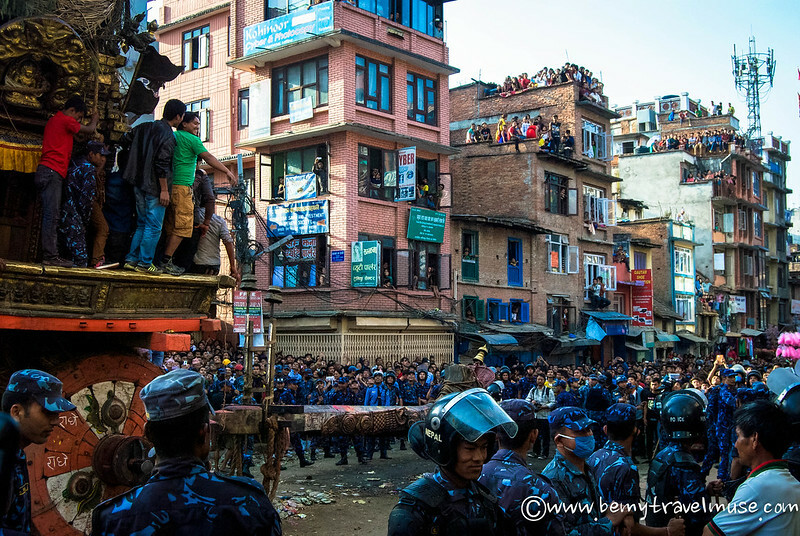 As we walked back to the main square I surveyed the crowd, finding that we truly were the only foreigners there. Moreover, we were met with smiles and nods of fascination and appreciation from those around us. It felt special. It felt good. …and it all started with a plate of choila. That looks a fun (and slightly intimidating) experience! Great photos 🙂 Cool story. I’m a fan of the rhyming title. I was wondering if it was a metaphor when I clicked onto it but nope, an actual coconut brawl. It sounds like a great experience. As much as I love doing my touristy things, I also love local experiences where people seem happy that you’re showing more interest in their culture. And, like most good things, it all started with food, glorious food. I didn’t even realize I had rhymed it! I would NOT want to be in that mass of humanity when they try to get that coconut … sounds like a good way to get trampled! I didn’t really want to be down there but found myself unable to escape. Thank goodness the coconut went the other direction! 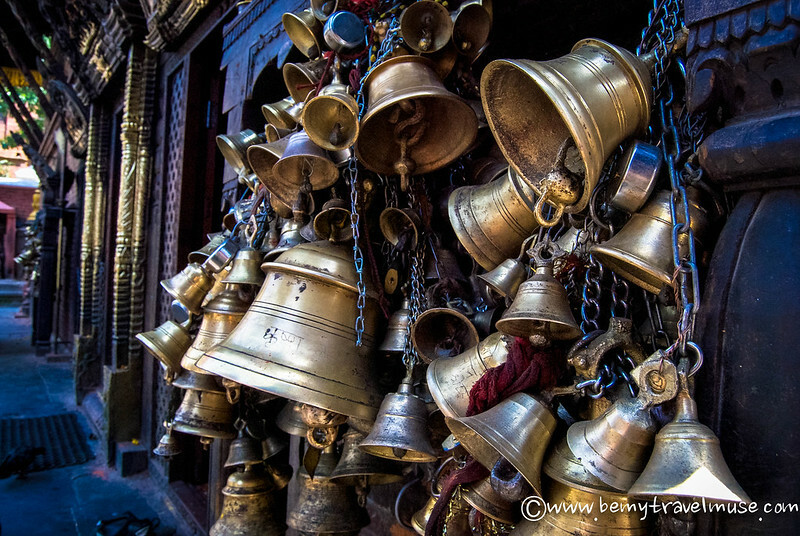 This sounds like a great experience, it’s these sorts of adventures which make travel great! Thanks for sharing.